The Tel Aviv square is going to become pedestrian-centric as Israelis do more shopping and eating out close to home. Paris and Madrid want fewer cars on the road - why doesn’t Tel Aviv? When the heavy construction equipment finished its work last week at Dizengoff Square, there really wasn’t much to see. The raised concrete platform that had long hidden the roads passing through the square was gone and in its place was a giant, empty, dusty lot surrounded by ficus trees. A few bulldozers were still in place. But for residents of Tel Aviv, it was akin to a historic event. People walking through the square – actually a giant circle – stopped to take out the smartphones and photograph. Dizengoff isn’t simply an intersection, it has a long (by Tel Aviv standards) and storied history and the multicolored Yaacov Agam fountain that once topped its concrete platform was perhaps the city’s most famous piece of public art. But Dizengoff – its past and future – also reflects the changing attitudes and priorities for Israelis as well, which was evident as the square’s shopkeepers and the regulars who occupy its park benches and sidewalks debated last week whether the area faced a bright new future or should have been left as it was. “If the city is going to invest 60 million shekels [$15.7 million] in rebuilding the square, they should have at least done something drastically different – but to restore it to what it was 40 years ago?” said Zevulun Grady, who has owned and managed a second-hand clothing store in an alleyway off the square for the last 10 years. “I like the square as it was. I could sit here all day in the sun. We had an open market once a week. It was great,” he said. Grady’s longing for the past stands in sharp contrast to the big hopes Amir Avitan and his partner and wife Bar Merom, who opened a boutique called Brenda two years ago on the north side of Dizengoff. The two expect to suffer a couple of years of noise and dust while the new Dizengoff is built, but they are confident that when it’s done, the new square will be a magnet for shopping and entertainment – a beneficiary of a sea change in shopping habits underway in Israel, away from shopping malls and retail chains and back to downtowns and small businesses. “This is a central place. People come here from all over the country,” said Avitan. And that’s the story behind the evolution of Dizengoff. 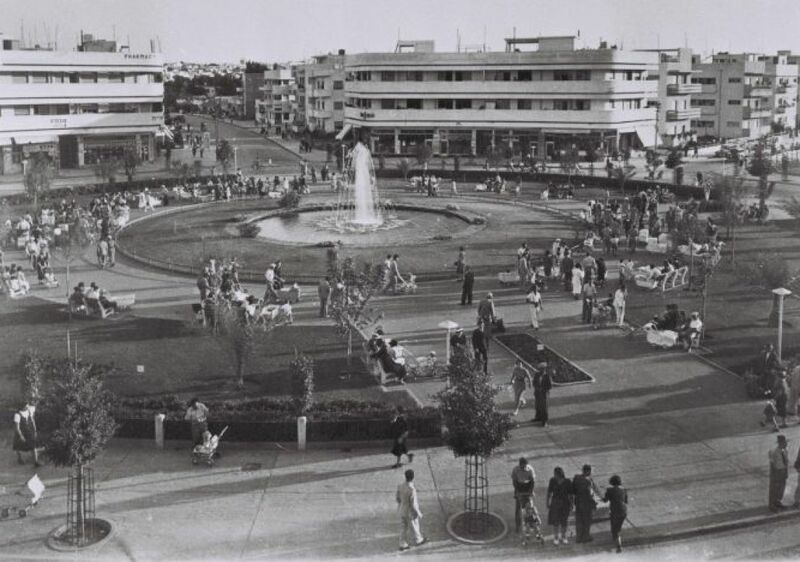 When it was opened to the public in 1938, Dizengoff was an open, grassy square. The Bauhaus buildings surrounding it fitted into a unified design scheme created by the square’s architect, Genia Averbuch. Six streets converged at Dizengoff, but the city had so few cars that they created little noise or pollution. By the 1970s, Tel Aviv was choking with cars, and pride in the White City’s architecture had yet to emerge. In 1978, the platform with the Agam fountain was erected over the square. Above was an airy open space for pedestrians; below cars barreled through a dark underpass. The buildings around the square were nearly invisible. The city hoped that by separating cars from people it would solve the problems of both pedestrians and drivers. It didn’t. One reason is that the new Dizengoff came on the scene as Israel was undergoing a shopping revolution, as consumers flocked to the shopping malls that were sprouting up and abandoned the downtowns. Another was the design itself. The square was disconnected from the surrounding streets and the businesses nearby. Grady recalls sharing his alleyway with a pub called Long John Silver and later a Russian restaurant, but these days he has the street entirely to himself. By day, Dizengoff became a hangout for pensioners seeking sunlight; by night, it was popular with wasted teenagers. Down below, it was no man’s land. “Under the square, taxi drivers would stop their cars and urinate,” recalled Arik Dror, a regular at the square who sells books he’s written himself. The new Dizengoff aims to restore the feeling of the pre-1978 square, said Yoav David, Tel Aviv’s city architect. The plan calls for a large open space at street level, exposing the long-hidden Bauhaus buildings surrounding it. Cars will travel the outer rim of the public space. “By lowering the square, we’re making a sort of correction and restoring the space to its original function,” said David. Tamir Ben Shahar of the Czamanski & Ben Shahar marketing consulting firm agrees there is a big change underway and Dizengoff is just one example. Even before the reconstruction got under way, shops and restaurants were gradually coming back to the square – a process, he added, that is also occurring in central Jerusalem, Netanya and Nahariya.